Trending at C $1,452.09eBay determines this price through a machine-learned model of the product's sale prices within the last 90 days. 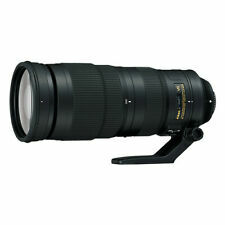 Tamron SP A08 200-500mm f/5-6.3 LD AF Di IF Lens. There is no wear. The very beautiful lens. All behavior is perfect. UP FOR SALE. It is virtually indistinguishable from new in appearance, is operationally flawless, and shoots perfectly. Glass looks to be perfect; optics clean and clear throughout, with no trace of any internal optical problem such as haze or fungus. AF-S NIKKOR 200-500mm f/5.6E ED VR Lens. A Silent Wave Motor AF system produces fast, near-silent focusing performance that suits both stills shooting and movie recording which can instantly be manually overridden by simply turning the manual focus ring. VR Vibration Reduction Stabilization with Sport Mode! A Silent Wave Motor AF system produces fast, near-silent focusing performance that suits both stills shooting and movie recording which can instantly be manually overridden by simply turning the manual focus ring. Excellent ! Country of Manufacture / Serial No. Japan / 503438. The state is superior as used goods. Condition Grade Excellent . We clean every product carefully and confirm the function by loading a film and taking photo. It appears to have received very little actual use and has clearly been well cared-for, as evidenced by the lack of wear to its mount and by its exceptional physical condition. You will not be disappointed. The lens is used a little. It is in perfect condition. Just a single dust inside. If it was used, it was used very seldom - appears in immaculate condition. I have the box, the lens, a plastic hood type piece, a carrying case for the lens. I do not see any mounts or the piece that would secure or seat the lens - so that accessory you will need to provide or source elsewhere. Nikon AF-S 200-500mm f/5.6E ED VR. Tripod Collar. Rear Lens Cap. Front Lens Cap. Nikon AF-S 200-500mm F2.6E ED VR. Spanning a long, versatile zoom range, the AF-S NIKKOR 200-500mm f/5.6E ED VR Lens from Nikon is a telephoto zoom characterized by a constant f/5.6 maximum aperture for consistent performance throughout the zoom range. The optical design incorporates three extra-low dispersion glass elements to reduce chromatic aberrations and distortions for increased sharpness and color accuracy. Also contributing to improved image quality, a Super Integrated Coating has been applied to lens elements to lessen flare and ghosting for improved contrast and clarity. A Silent Wave Motor AF system produces fast, near-silent focusing performance that suits both stills shooting and movie recording, which can instantly be manually overridden by simply turning the manual focus ring. MPN: 20058. Nikon AF-S NIKKOR 200-500mm f/5.6E ED VR Lens. A Silent Wave Motor AF system produces fast, near-silent focusing performance that suits both stills shooting and movie recording, which can instantly be manually overridden by simply turning the manual focus ring. Focal Length 200 - 500mm. Format: Nikon FX/35mm Film. NOT compatible with Nikon Film SLR models,D1 series models, D2 series models, D200, D100, D90, D80, D70S, D70, D60, D50, D40X, D40, and D3000. Focal Length 200 - 500mm. A Silent Wave Motor AF system produces fast, near-silent focusing performance that suits both stills shooting and movie recording which can instantly be manually overridden by simply turning the manual focus ring. Reflecting the vivid wings of the peacock with real optical performance ?. Tamron SP AF 200-500mm F5-6.3 Di Zoom Lens for Nikon A08N in Excelent Condition from Japan. Tamron Headquarters is located in Saitama City in the Saitama Prefecture of Japan. Tamron has sold more than 5 million lenses as of September 2014. VR (Vibration Reduction) Image Stabilization Yes. 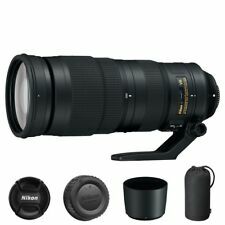 NIKON AF-S NIKKOR 200-500mm f/5.6E ED VR Lens. Mount Type Nikon F-Bayonet. (108 mm) x 10.5 in. Focal Length Range 200-. Maximum Angle of View (FX-format) 12°20'. Lens mount Nikon F. Lens type Zoom lens. Focal length (wide angle side) 200 mm. F value (wide angle side) 5.6 f_stop. (More than a month). It takes a while (depends on a country but about a month). I'm Japanese living in JAPAN. VR (Vibration Reduction) Image Stabilization Yes. Autofocus Yes. NIKON AF-S NIKKOR 200-500mm f/5.6E ED VR Lens. Mount Type Nikon F-Bayonet. (108 mm) x 10.5 in. Focal Length Range 200-. Maximum Angle of View (FX-format) 12°20'. Silent Wave Motor AF System Vibration Reduction with Sport Mode. F-Mount Lens/FX Format Aperture Range: f/5.6 to f/32. All my products are 100% Authentic !